There is quite a controversy over whether or not polishing laps should be scored. Obviously, no one would score a ceramic lap, because it is so hard (Moh’s 9). Most other laps, such as phenolic, Lucite, wax, bronze, zinc, tin and tin alloys are commonly scored by the contingent of faceters who favor scoring laps. 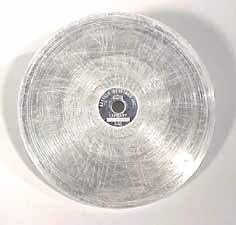 The instructions packaged with the Crystalite solid tin lap states quite firmly that the lap should not be scored. However, I know people who have disobeyed these directions and get excellent results. When I bought my first tin/lead lap, I was told to score my lap with a utility knife. I did as I was told and was disappointed by the rounding of the facets on the first few stones I polished on the lap. After the lap was broken in, it not only started to polish quicker, the rounding of the facets was no longer noticeable. I have used my tin/lead lap for years and it has started to leave tiny “horsehair” scratches on my stones. One possibility for my scratching problem is that my lap is contaminated. The original scores I put into the lap when I bought it are now worn flat, so another possibility is that I need to re-score my lap. I’m reluctant to put new scores on the lap because I don’t want to revisit the problems I had with rounding of my facets. A friend of mine uses a BATT lap with 50,000 diamond for polishing. BATT laps are supposed to have a crystalline structure that reduces the need to score the lap. He was having terrible problems with the lap scratching and decided to score the lap with a hacksaw blade. The scratching problem went away. Why does scoring help? The answer most people give isn’t very scientific. Supposedly, the grooves allow the polishing agent, (oxide polish or diamond), to remain on the lap longer. The scores are also supposed to allow a safe route to flush out large conglomerations of the polishing agent and small fragments of the stone being polished. These conglomerations and fragments create bad scratching problems. If they can actually be directed toward the edge of the lap without coming into contact with the facet being polished, that’s a true advantage of scoring. The problem with all of this anecdotal evidence is there are many people who never score their laps and get excellent results. My advice is not to score your laps unless you have tried everything else to no avail.